DESCENDER, the award-winning science fiction series from creators JEFF LEMIRE and DUSTIN NGUYEN, is captured in a bold T-shirt featuring fan-favorite, TIM-21! 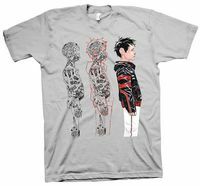 With stunning art on the front, and the series logo on the back, this charming graphic Tee tells the world that the machine kind evolution is here! Legal Notice: Entire contents trademarked (® or TM) and copyrighted (©) 1986-2019 by Things From Another World, Inc. and respective copyright and trademark holders. All rights reserved. Page rendered at 2019-04-19 02:11:21 in 1.188 seconds.